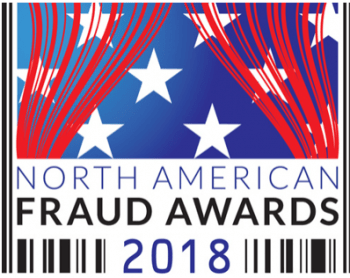 Winners were announced for the 2018 North American Fraud Awards as part of an award presentation held Thursday night, May 17th at the Hilton Anatole in Dallas, Texas. As part of the Retail Risk international conference series, the North American Fraud Awards celebrate the very best individual and team performances, innovative new products, and winning industry strategies across North America. Retail Risk conferences are run solely to help retailers, academics and law enforcement personnel fight crime; both in their online and physical stores. Award finalists were selected and winners chosen by an independent panel of 15 highly respected loss prevention leaders and program pyramid heads. The Best Newcomer Award recognizes the most exciting new vendor or solution to enter the retail risk and loss prevention arena, supplying any part of the risk and loss prevention industry. To qualify the solution or company must have launched within the last two years. The Most Innovative In-Store Solution looks at innovative approaches to an existing, tried and tested solution or genre. The solution can either be from a vendor or part of an in-house retailer solution. The Most Innovative Online Solution looks for innovative approaches to an existing, tried and tested solution or genre. The solution can either be from a vendor or be an in-house retailer solution. The Vendor of the Year Award represents a solution provider who consistently goes over and above the role of ‘just’ being a supplier, acknowledging those vendors who form tangible and lasting partnerships with their retail clients. The Best Collaborative Solution represents a partner that provides real, tangible business benefits resulting from genuine collaboration along with a clear ROI, tangible business benefits and an invaluable service. This category is open for both retailers and vendors to enter. The Rising Star Award recognizes the success of an outstanding individual who has made a positive contribution to the bottom line performance and overall loss prevention landscape within their place of work. This winner does not need to work full-time in risk management, but could be a from another discipline but who really ‘gets’ risk and as such has made a significant difference, either financially or culturally within their place of work. The category is open for both retailers and vendors to enter. The Asset Protection Manager of the Year recognizes outstanding regional or divisional heads who provide both their stores with genuine support and guidance in the fight against retail risk, fraud and loss prevention, but who also get the bigger companywide aims and objectives and as such bring genuine value and benefit to their company and wider network. The Asset Protection Team of the Year recognizes the Profit Protection team that undertook that difficult technology role out that was delivered in record time, or that enthused a whole company to ‘think shrink’. This Award is a real pat on the back for whole team – the name says it all. The Retail Risk ‘Hall of Fame’ recognizes someone whom the judges feel has contributed above and beyond to the cause of retail fraud, risk and loss prevention. The Asset Protection Director of the Year looks for outstanding contribution from one individual. That could be in the face of difficult trading conditions, or the implementing of challenging new strategies and technologies. The winner of this prestigious award will be recognized by his or her peers as being at the pinnacle of modern retail risk and loss prevention and a leader in their field.